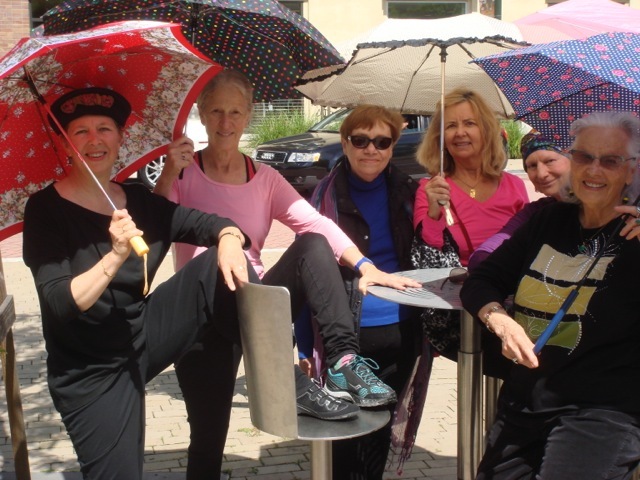 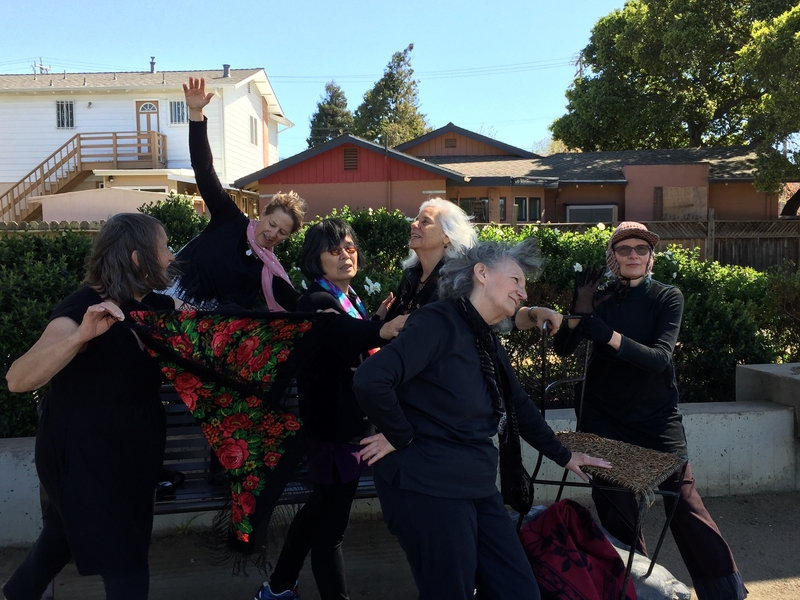 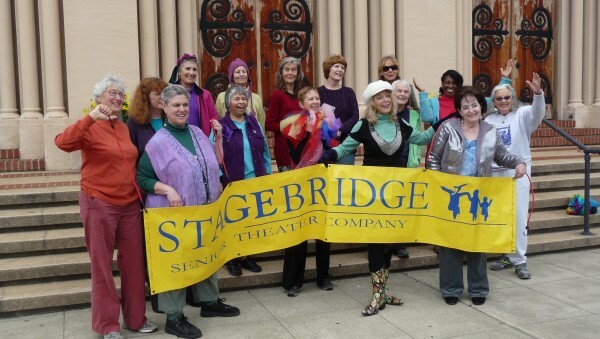 The Impromptu No Tutu Ensemble are dancers age 50-90+ celebrating our lives through movement, music and percussion. 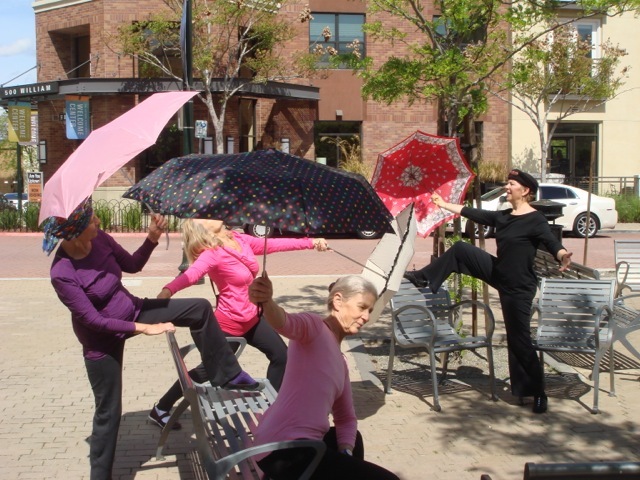 Our mission is to open the horizons of dance for all ages, inspiring a new view of aging as a crescendo of creativity and community. 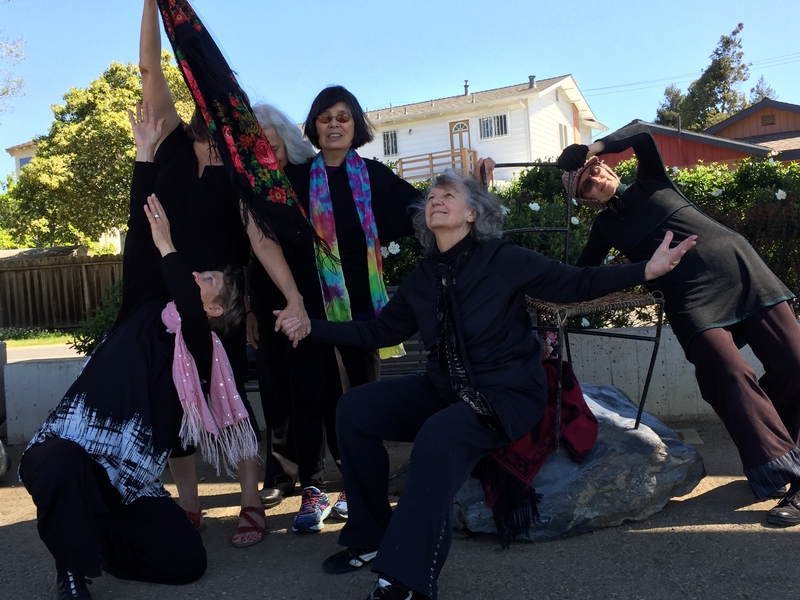 Artistic Director Greacian Goeke is an Orff Schulwerk movement and music teaching artist who nurtures creative expression in preschoolers, elders and all ages in between. 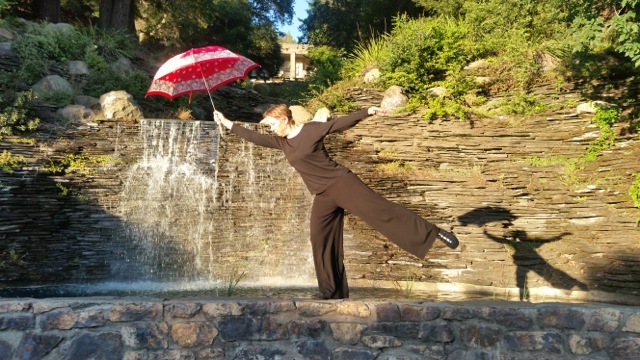 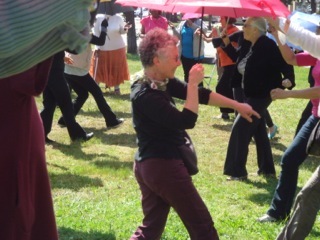 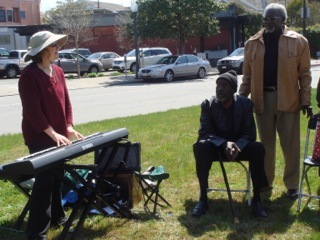 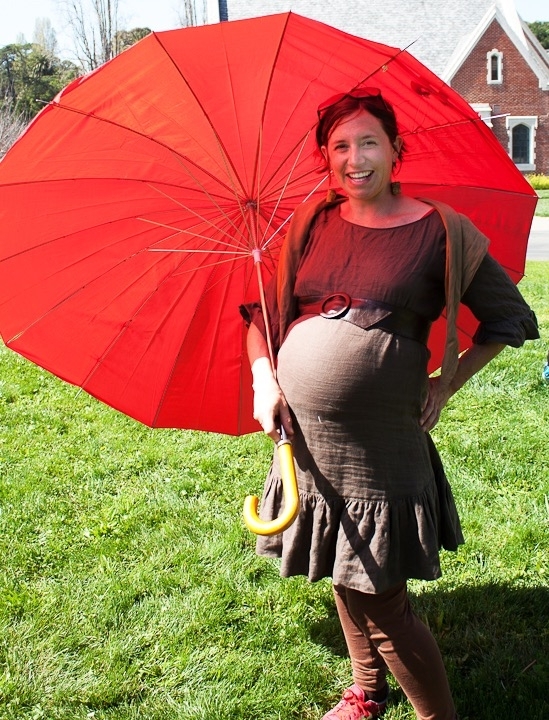 She also dances with the USF intergenerational company Dance Generators, and teaches T'ai Chi Ch'uan in the East Bay. 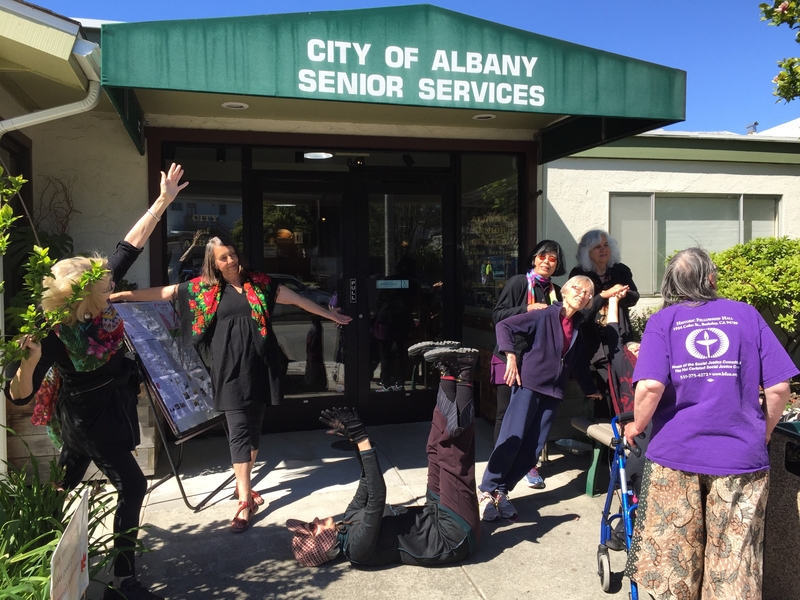 Dancing with Impromptu No Tutu, the resident creative dance company of Albany Senior Center, and staff and other members of the Senior Center. 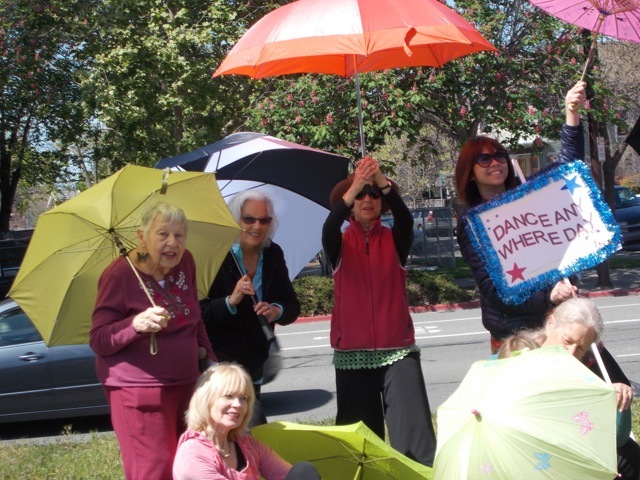 This year we danced in honor of Louise and Brian Donleavy, a dancing couple who continually inspire us. 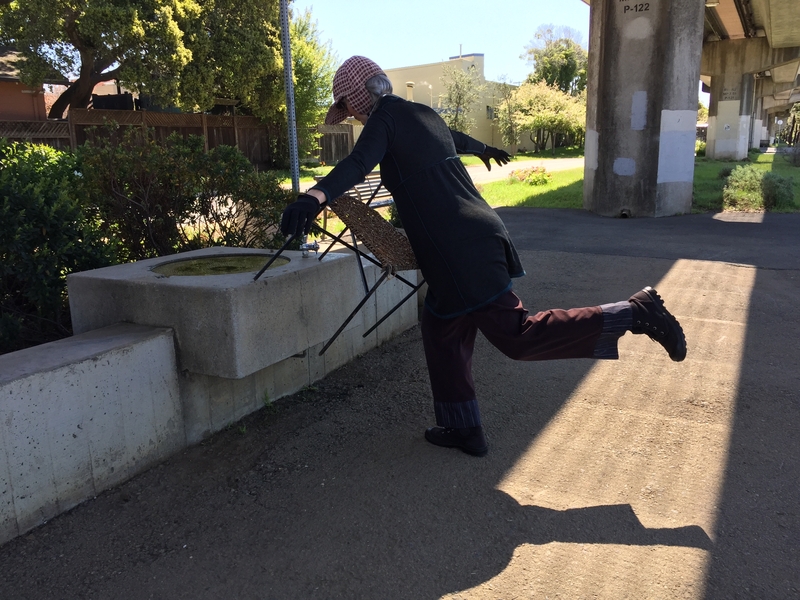 Brian photographed No Tutu's first Dance Anywhere on the median near Berkeley Bowl in 2013. 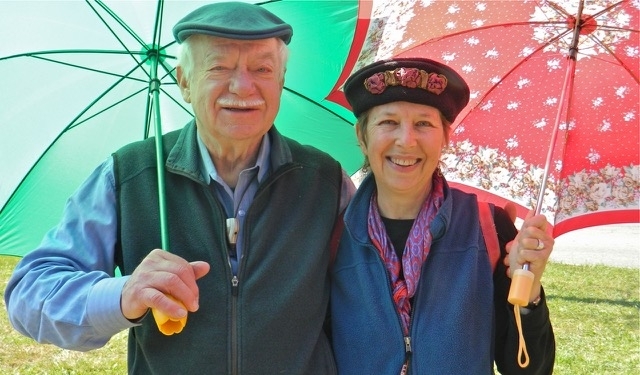 Sadly Brian died unexpectedly this year on March 24. 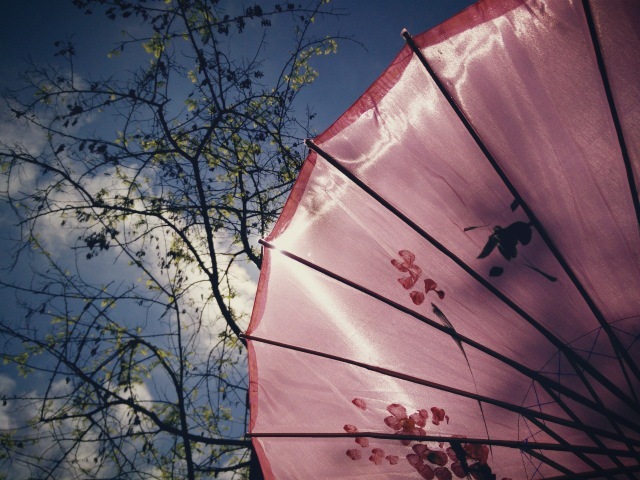 In his memory I'm including some of his photos at the end of this current year. 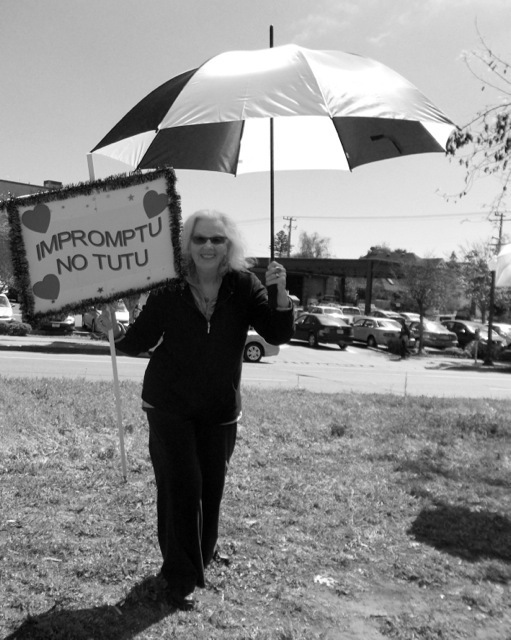 Louise is dancing on without her beloved partner as a vital member of the No Tutus. 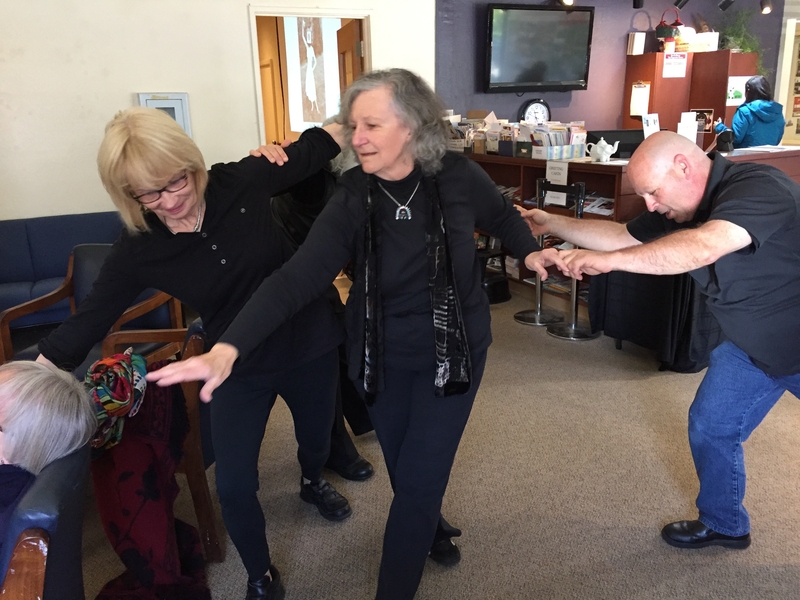 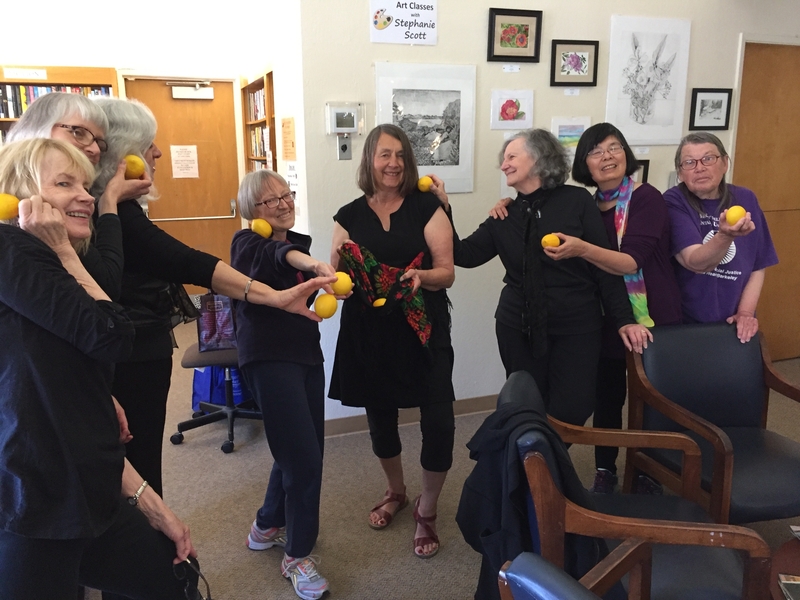 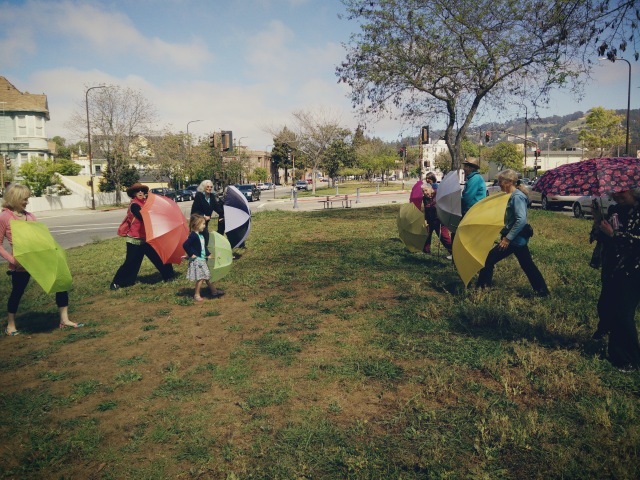 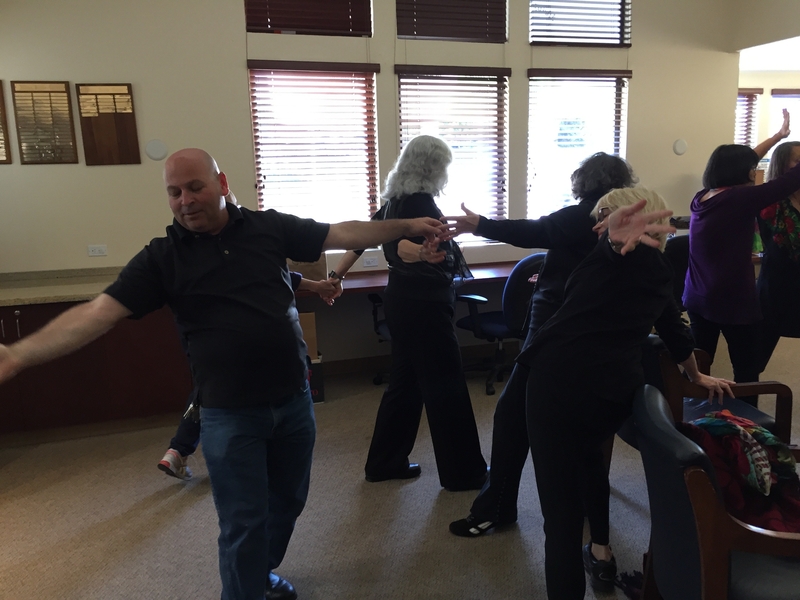 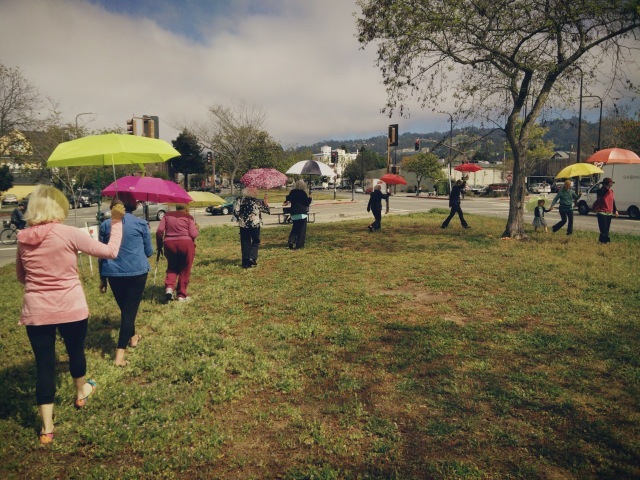 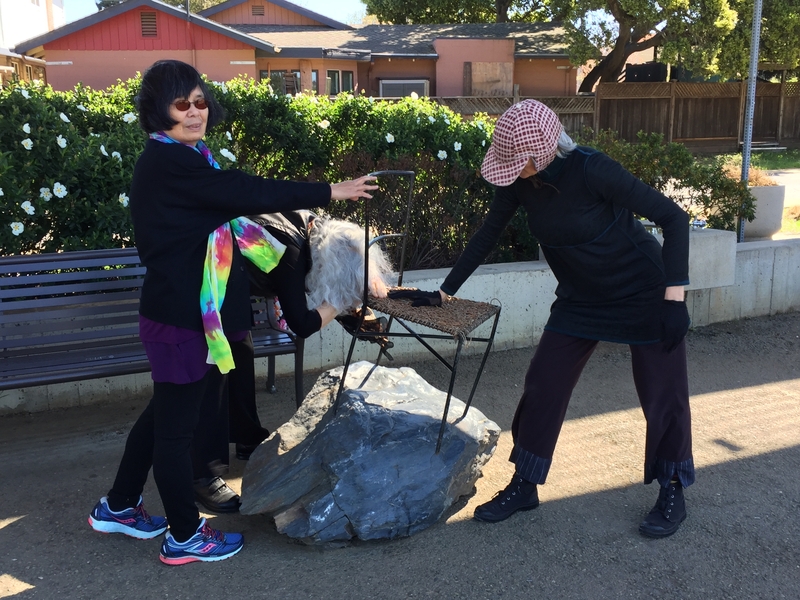 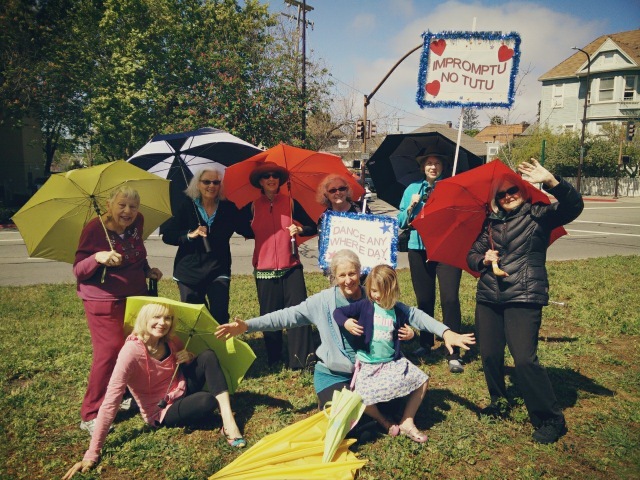 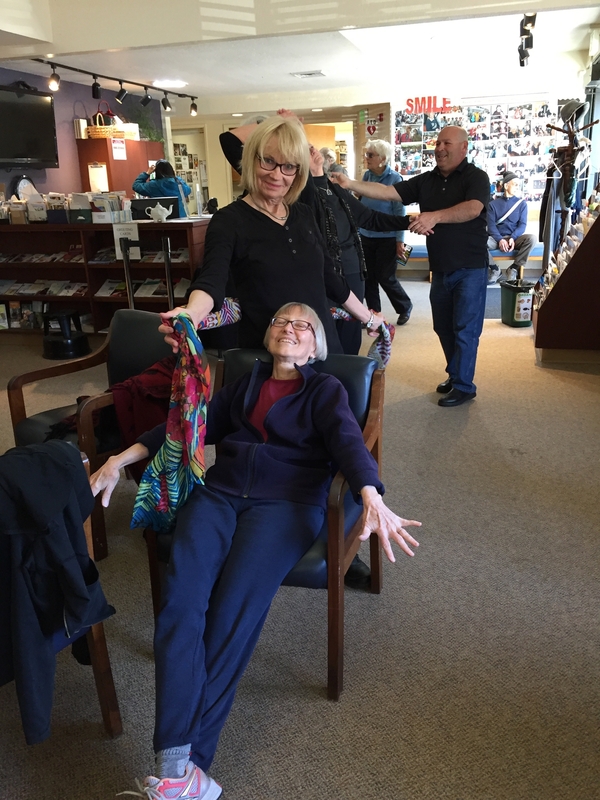 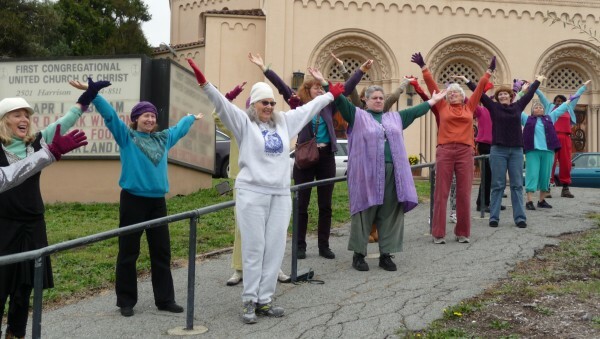 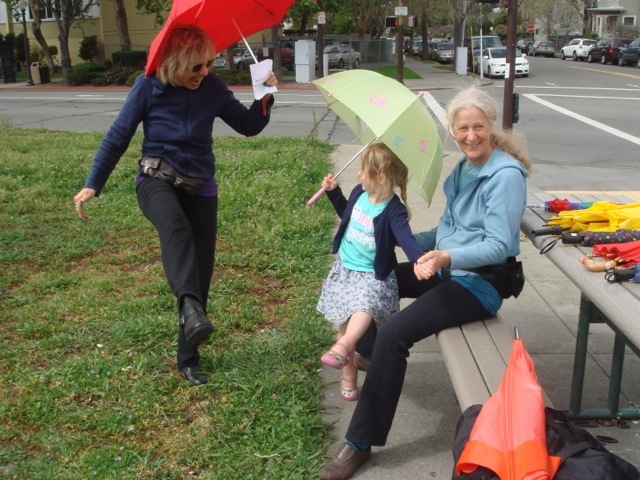 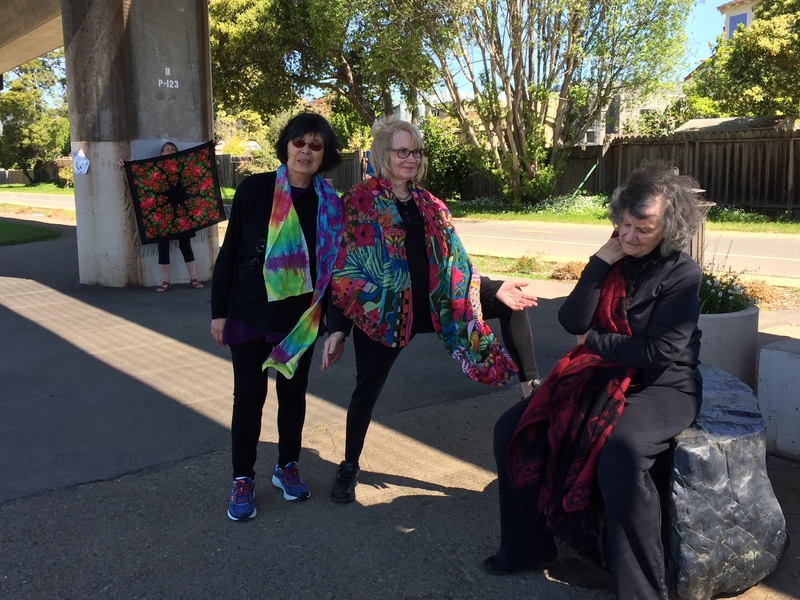 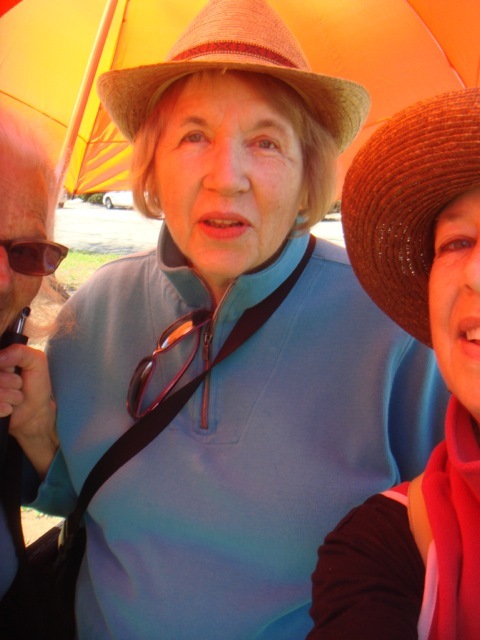 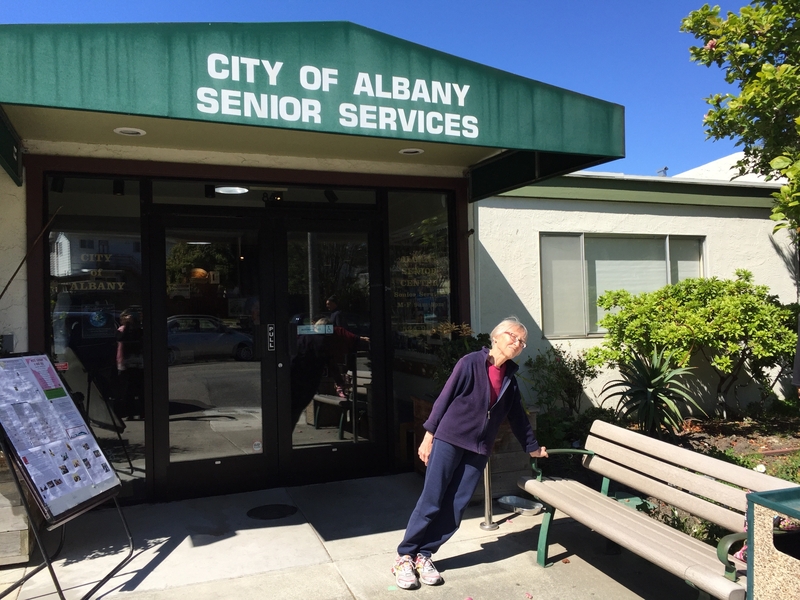 Two members who could not join us in Albany sent photos of their simultaneous dances in San Francisco and Vallejo and I am posting their pictures here as well. 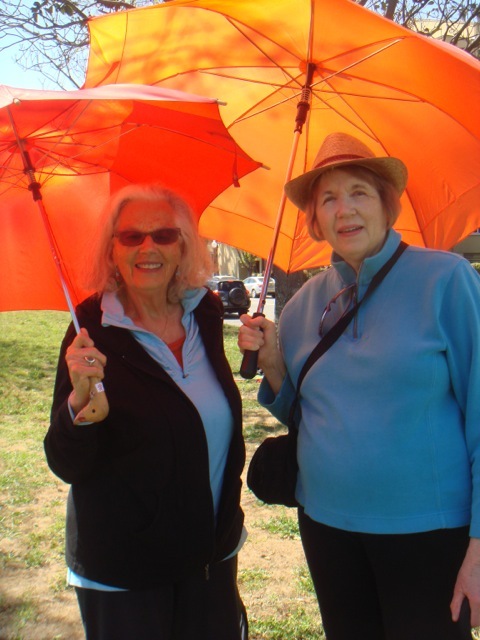 Thank you, Nina and Beth! 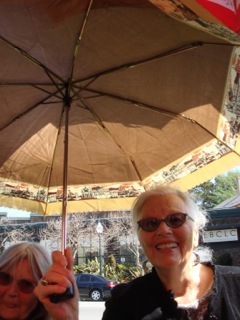 We missed you. 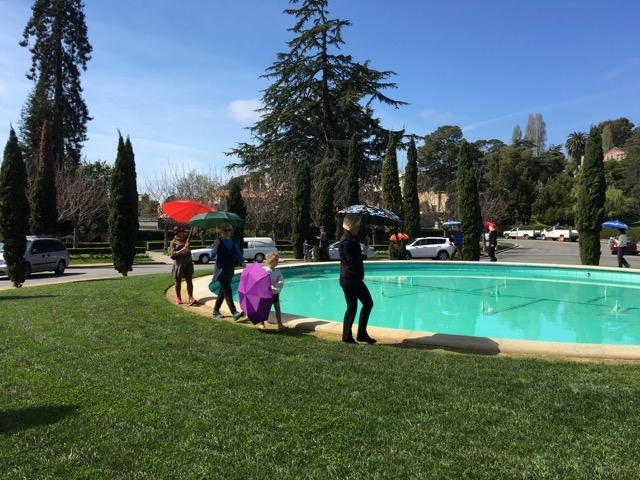 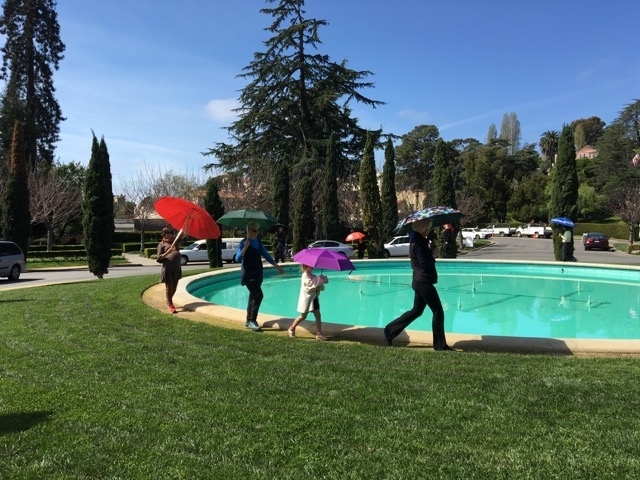 Mountain View Cemetery meet at 1pm at the circular fountain just inside the gates to the right; bring an umbrella! 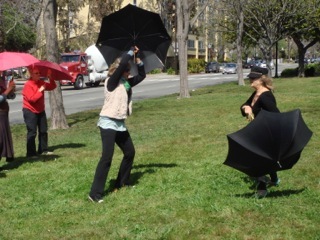 Danced with Impromptu No Tutu and members of the public. 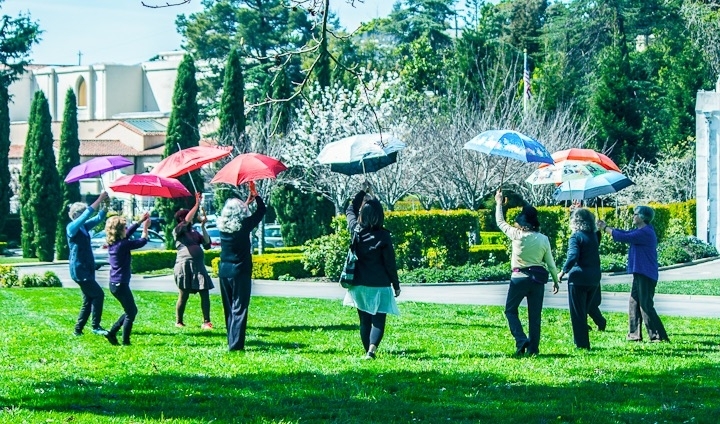 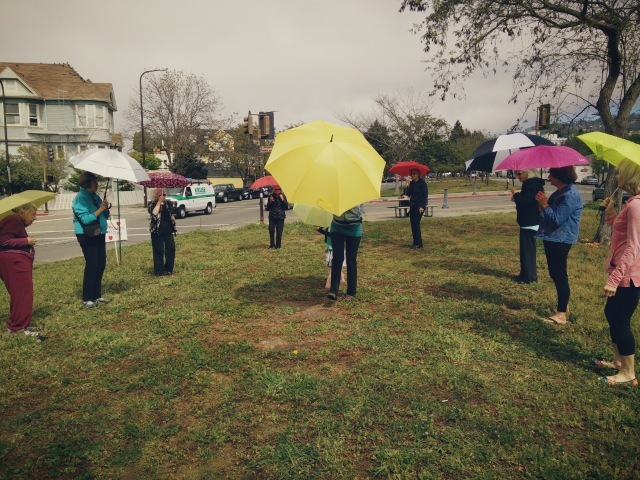 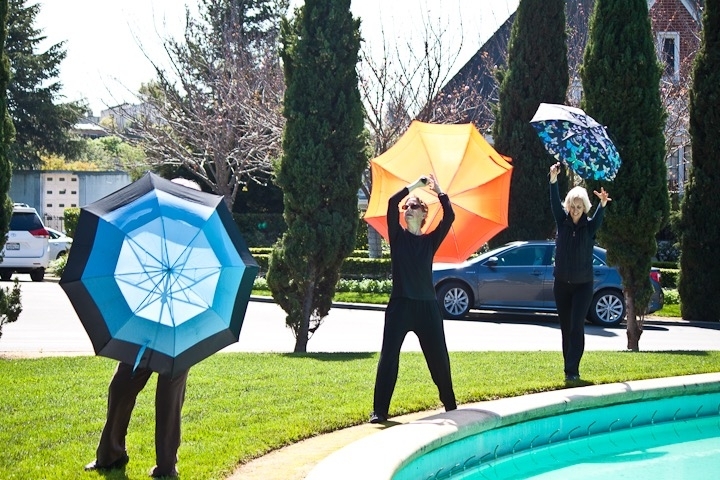 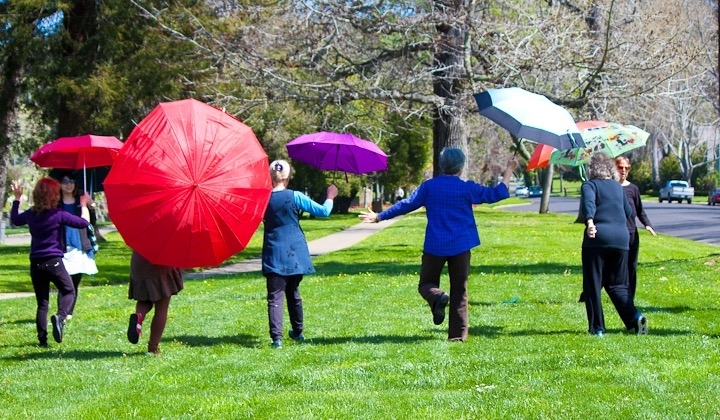 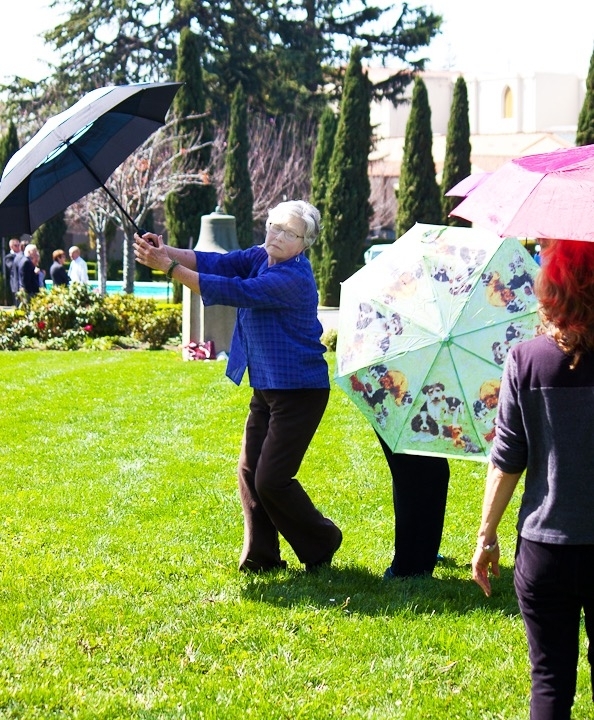 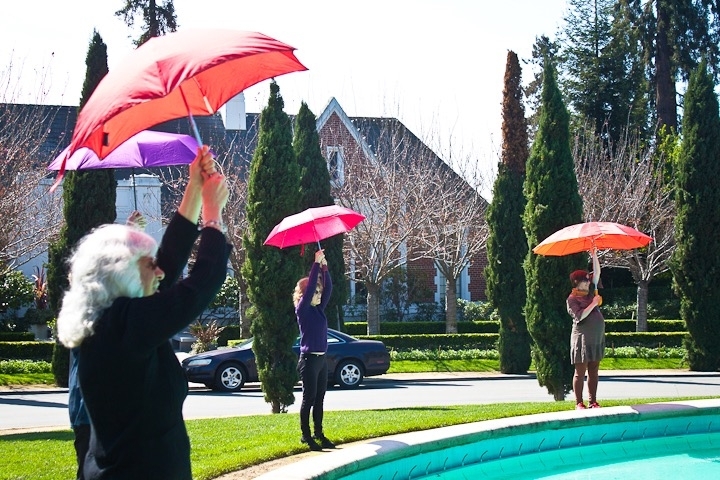 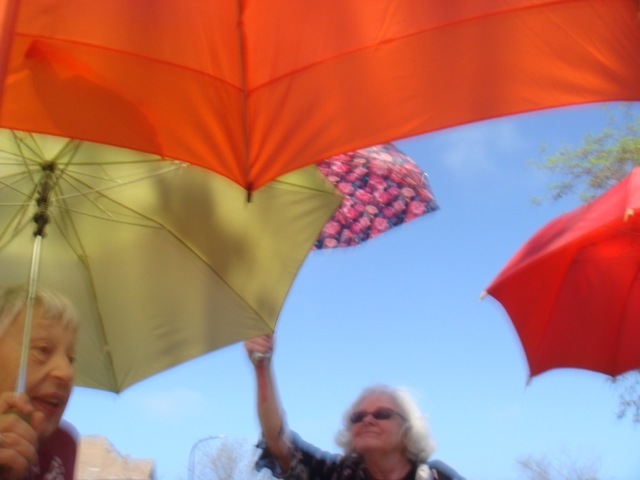 Bring a colorful umbrella if you have one; there will be a few extras on site. 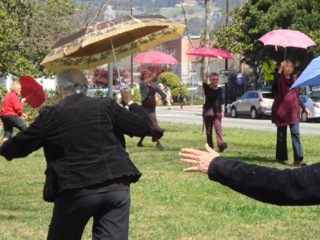 Meet on the grass at Adeline and Oregon by 11:45 am; dance begins at noon. 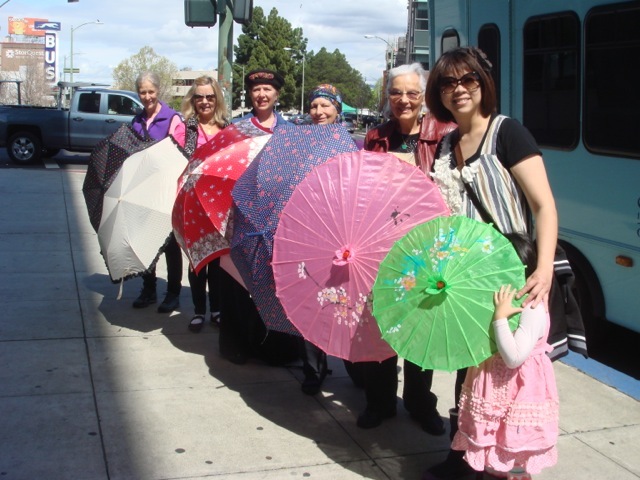 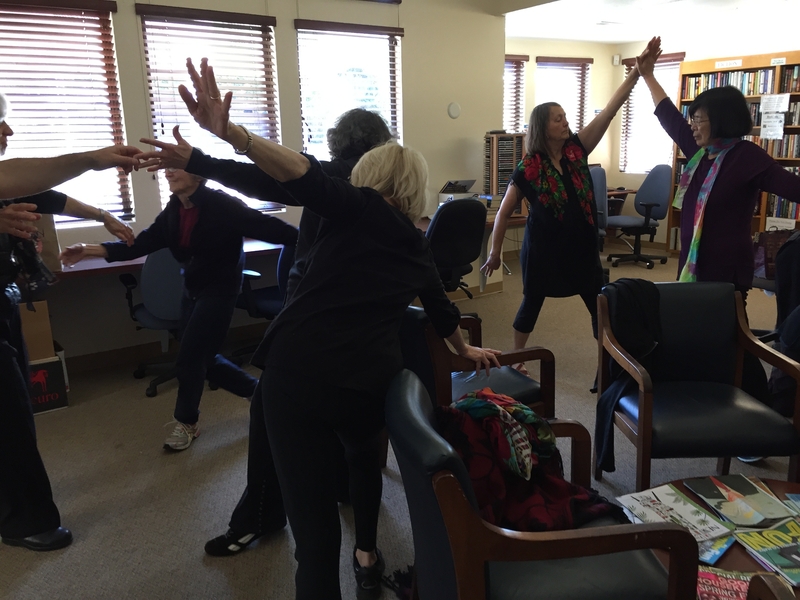 Danced with Impromptu No Tutu elder movement ensemble and friends together with clients of Center for Elders Independence (CEI). 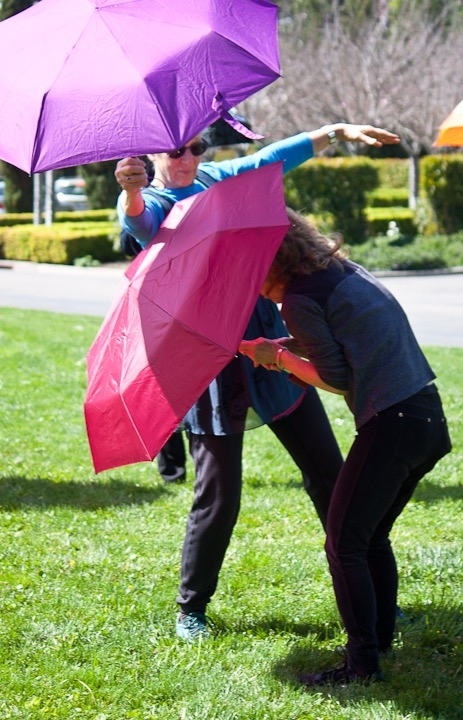 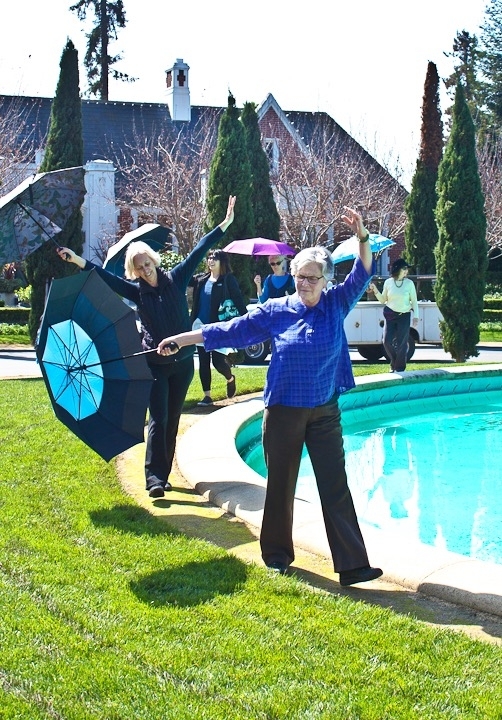 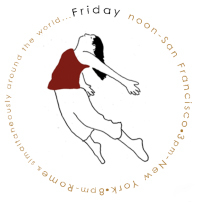 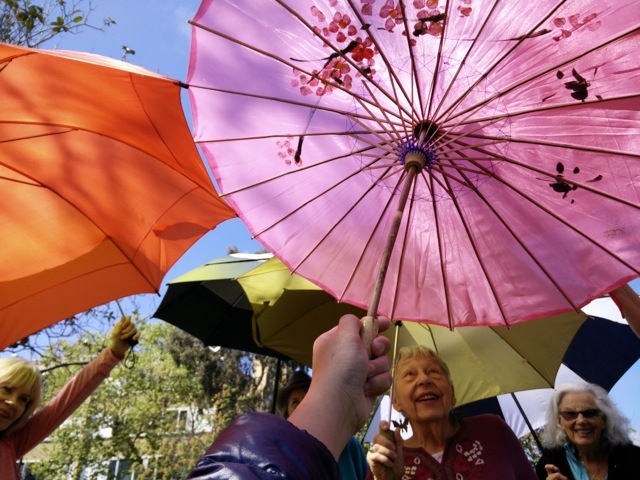 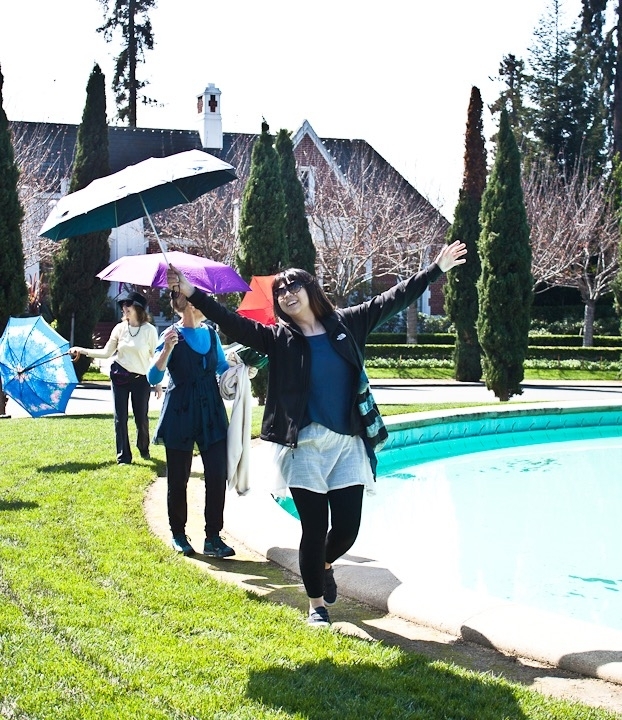 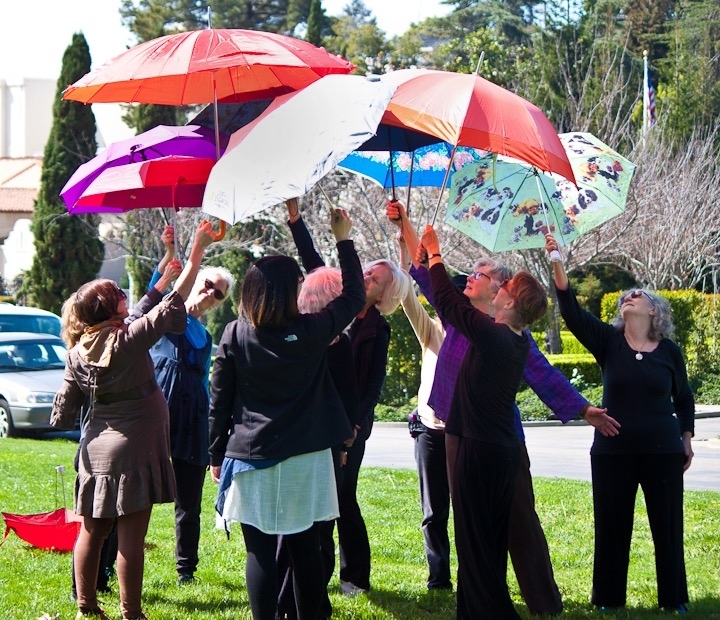 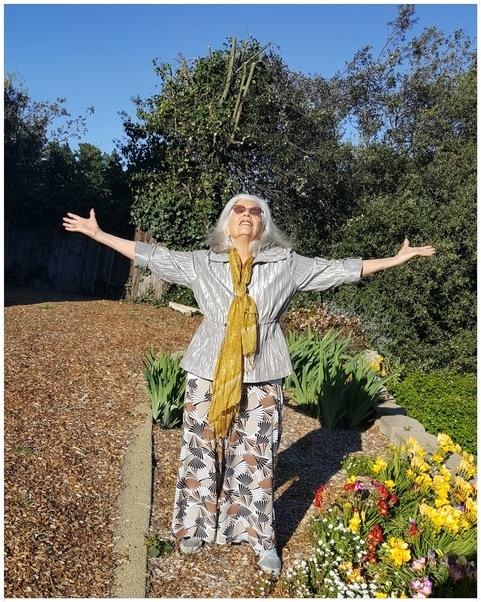 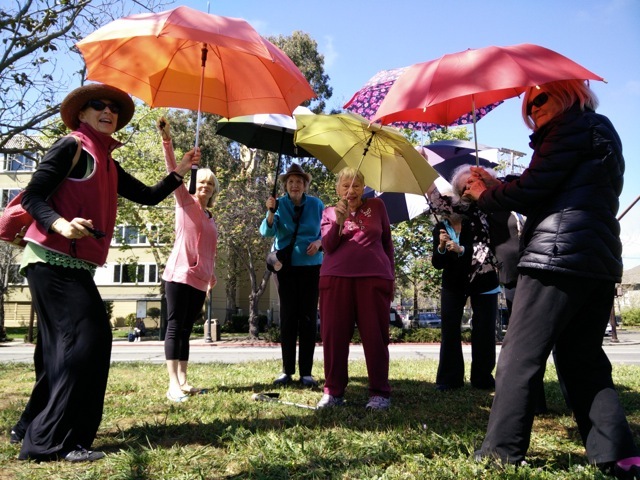 NOTE: Because of CEI's schedule we are meeting at 12:30 pm at San Pablo Avenue and Thomas L Berkeley Way (across the street from CEI) and dancing over to the CEI courtyard garden. 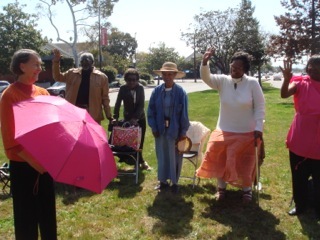 Dancing with the community at CEI was the best! 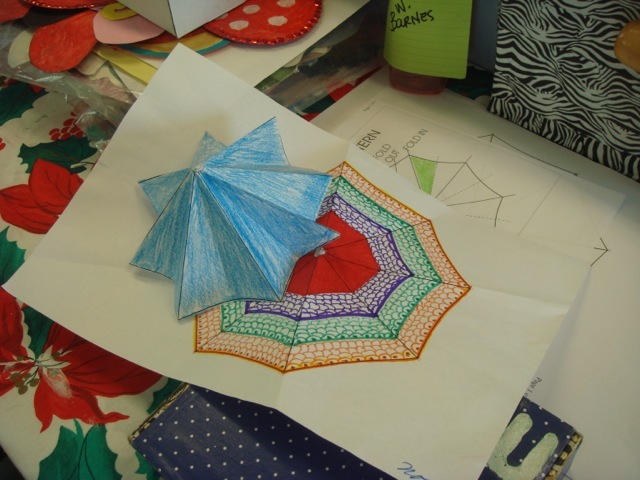 We were very touched to see that the art class created mini-umbrellas for table decorations in anticipation of our visit. 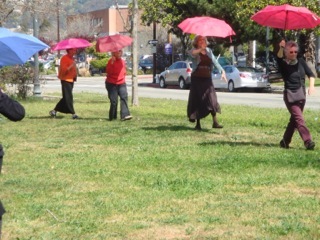 Thank you to everyone who participated, especially those who danced down in the valley and shared a motion! 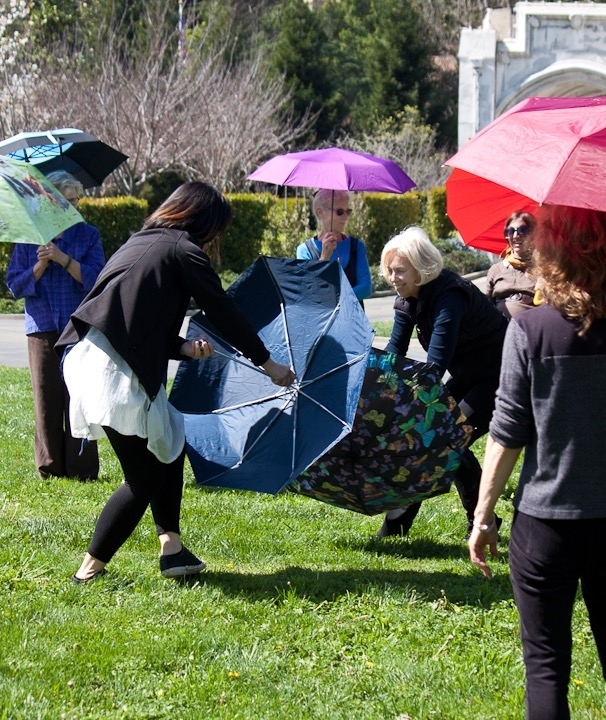 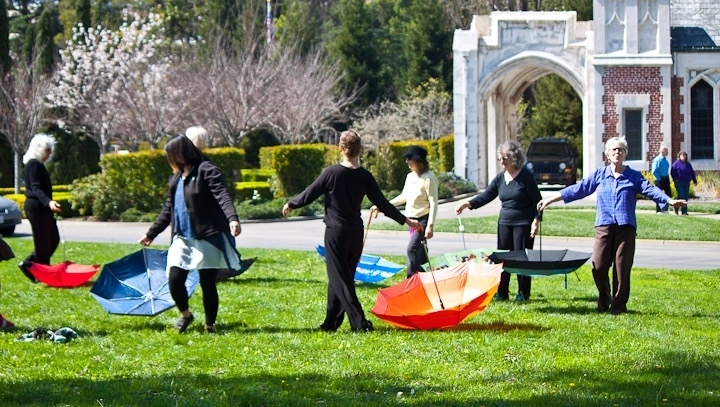 Danced with Impromptu No Tutu elder movement ensemble led by Artistic Director Greacian Goeke. 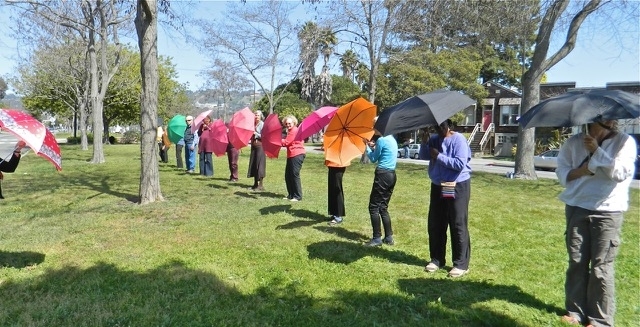 We will improvise an umbrella dance accompanied by gospel singing by the SNAP Choir of Richmond led by Laura Sherman and LaJuana Clark. 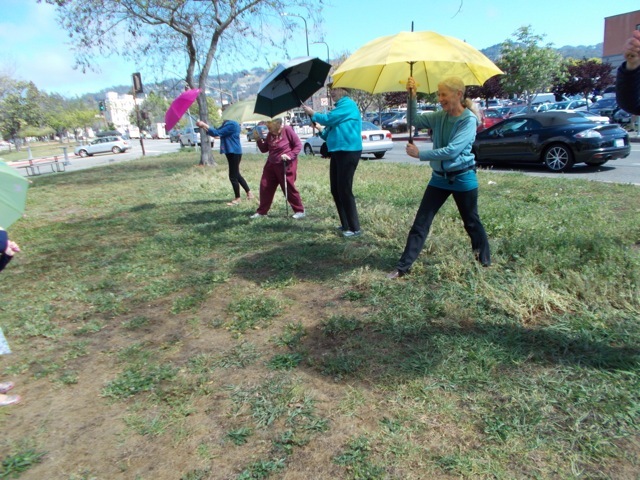 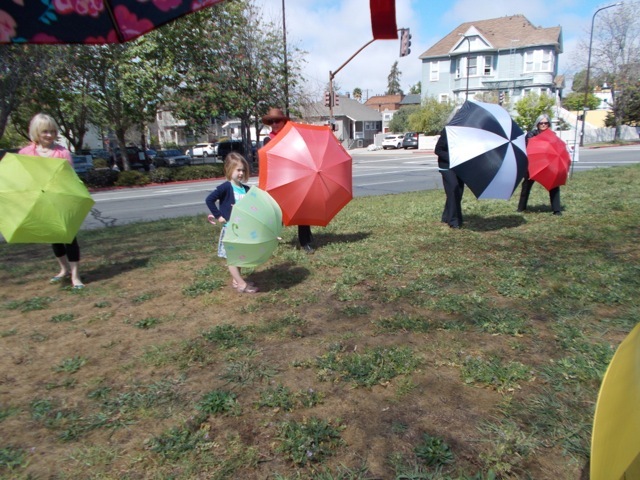 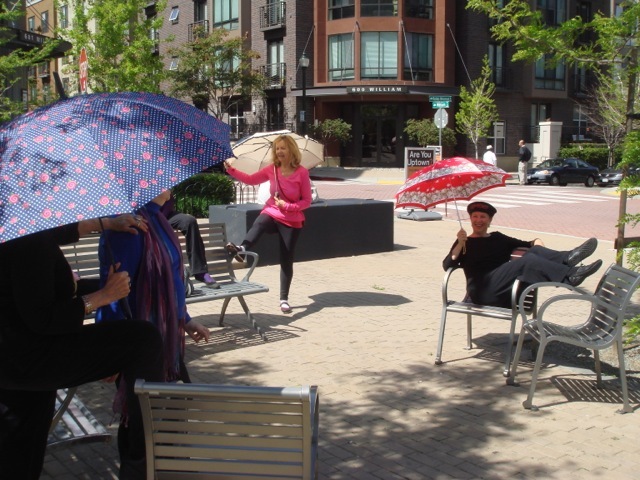 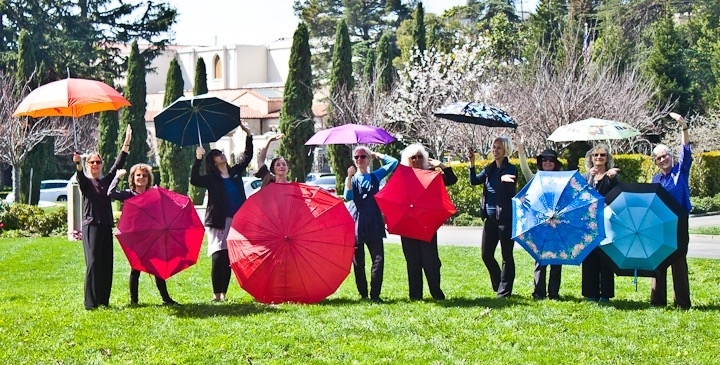 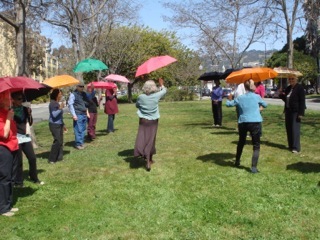 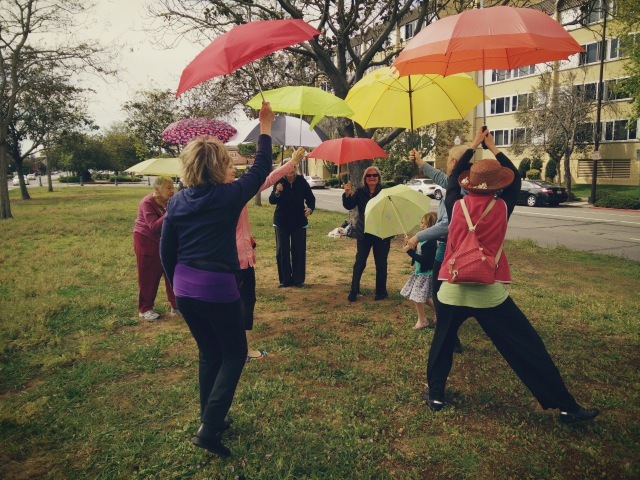 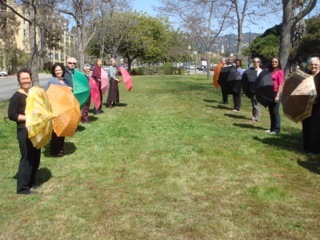 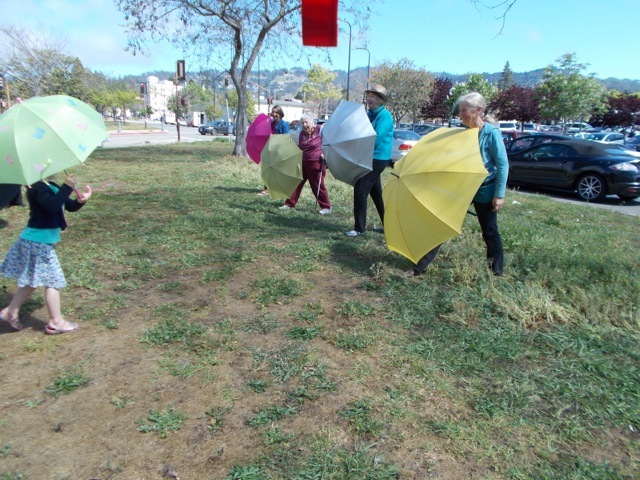 Thank you, Greacian, for our umbrella dance, what fun! 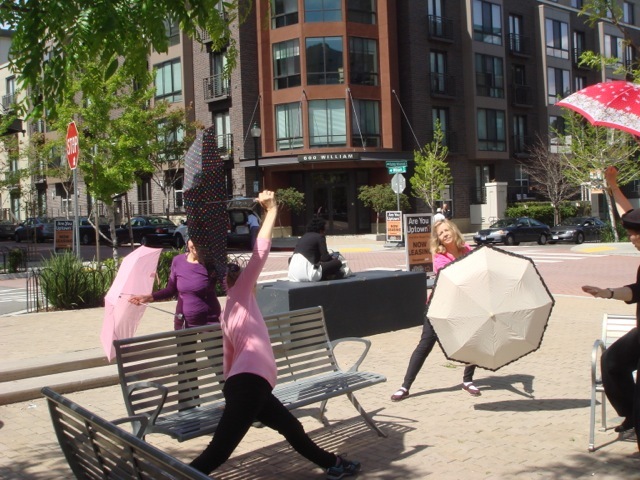 Loved the choreo, definitely developable if ever you want. 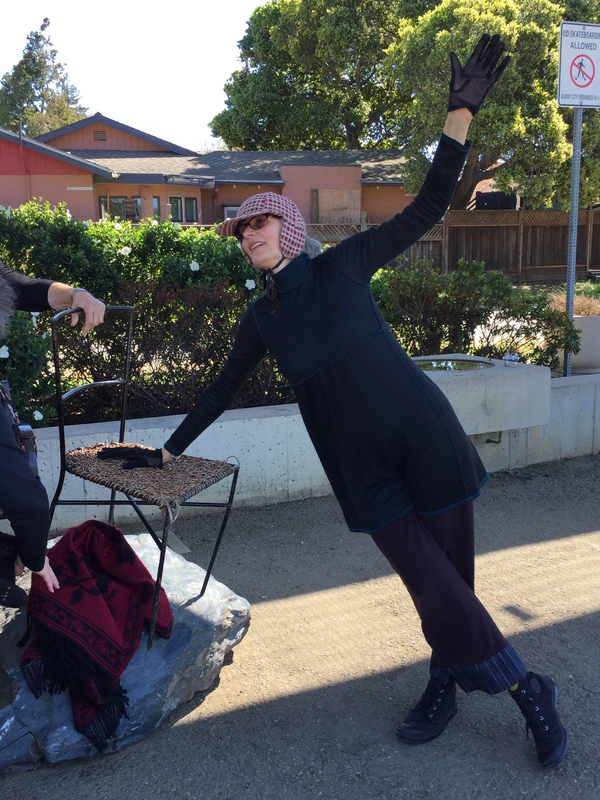 . . Glad I got to spend another Dance Anywhere day w/ you! 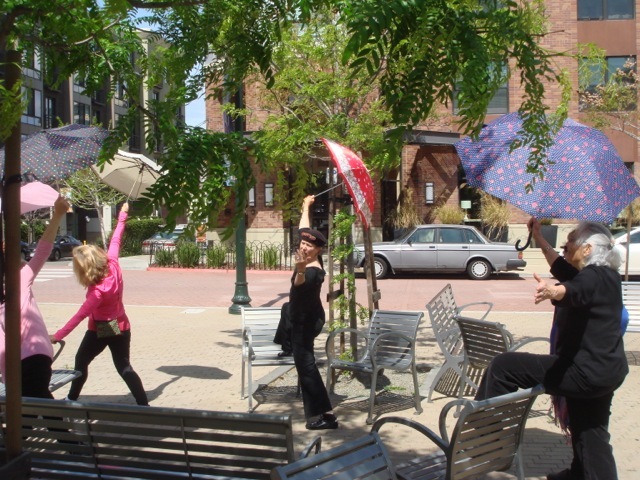 This was a great experience moving in concert with others and knowing there were people worldwide dancing with us. 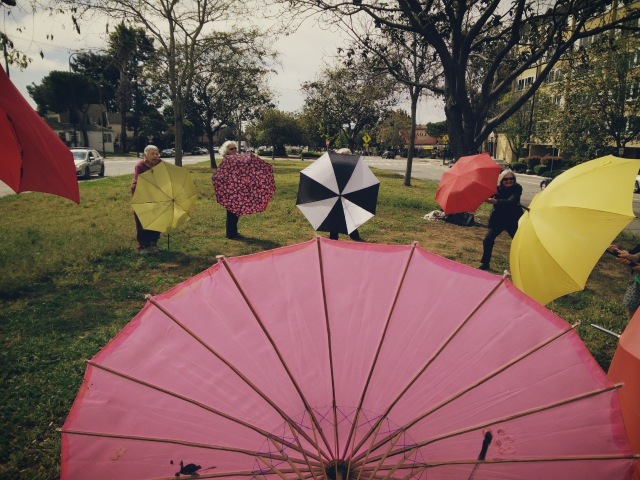 We realized that this is just the beginning for No Tutu of dancing with umbrellas and collaborating with the SNAP Choir. 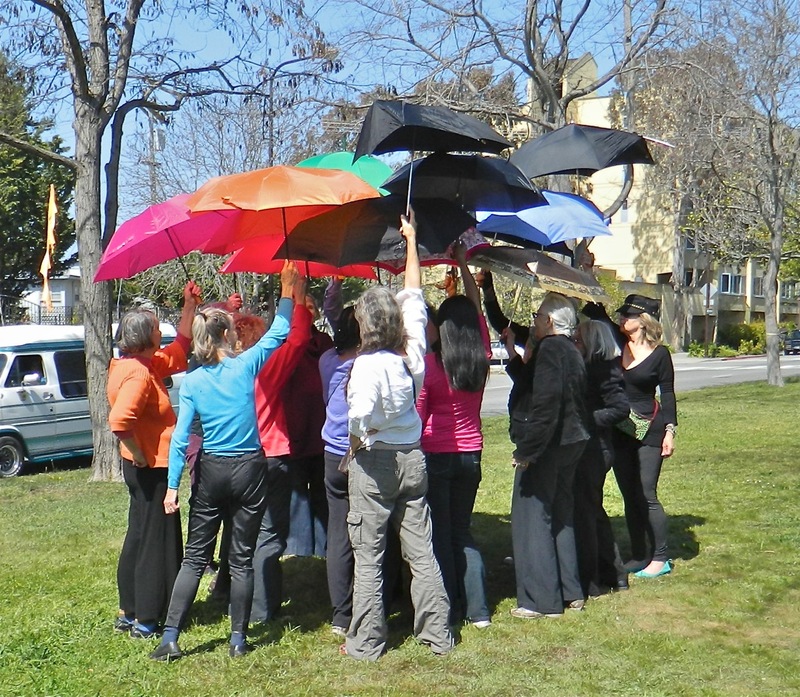 Watch for upcoming events!